1. It is always advisable to set off with a plan in your mind and a generic outlook of what your living room should be like. It does mean that you should know every head and tail in advance but a general idea will add the icing on the cake. It will help you during the decoration. As behind every successful project, there is a strategy and a plan, same should be applied here. 2. You should do a lot of research work before deciding on the look of your room. Just go through some magazines or catalogues, or better you can surf on Freshome and search for the designs, colors or styles you are longing for. Just tear the page of the design which you like and keep it aside for future reference. After you get a collection of different designs, try to choose those designs which catch your interests and ideas the most. I agree that a lot of confusion will also prevail but you should be able to think and act fast and come to the conclusion as confusion will eat your time and take you nowhere. Also, once decided, you should not regret. So, you should also decide carefully and be firm by sticking to the decision. 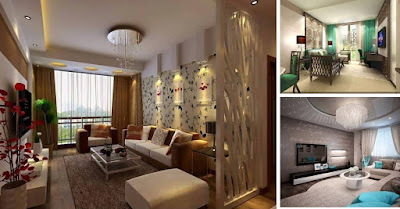 3.Lighting plays a significant role in the success of your decoration. It does create a good ambience. It adds to the shine and glitter of the room, also making our moods shine and glitter. It can spur our senses and raise our oxytocin levels which are responsible for emotional joy. Also, scented candles can bring in an additional spark to the room. 4. Choosing the right furniture is as essential as oxygen is for our body. After choosing, placing the furniture in a proper way is also equally important. Mostly, you should not place the furniture lined up against the wall. Your room will be looking smaller by this kind of arrangement. If you want more tips on how to make a room bigger check our article. 5. Another thing important is making use of the right curtains. Your efforts may seem like a flash in the pan if the curtains are not proper. Mostly, choose the curtains which match he color of the furniture. So, do not lose it all in the last minute just because of one silly mistake. 6. Adding to the most important things, flooring is also another thing that should be kept in mind. It is essential for furnishing. The coverings of the floor can be tiles, carpet or wood. You should see to it that it should be of a similar color or a darker shade than the walls. 7. There should be proper amount of free space for the functioning of daily activities, for e.g. walking. Else, the room will appear like a furniture shop. 8. Any cool accessories could add a zing to your room. You could pick up some pieces from craft shows and flea markets. Mostly, accessories should be artifacts, goodies or some items that you treasure. 9. One could use plants, flora or trees to provide a kind of natural beauty to the atmosphere of the room. It will also fill in the empty spaces, and if you are not convinced yet about the importance of plants in your home check this article. 10. Some interesting paintings can really bring in a wave of deftness to your room. It acts as a style to your room.